Why poets shouldn't seek agents. 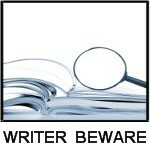 SFWA supports a site called "Writers beware," which tries to maintain warnings against literary scams. A recent post by Victoria Strauss to Writers beware is "Why Poets Should Not Seek Literary Agents"
"Beware, therefore, of literary agents whose guidelines indicate that they are looking to represent poets, or who put out calls for poetry collections. Be especially wary if a literary agency claims to specialize in poets. Nearly always, they’re either unscrupulous operators looking to charge a fee, or amateurs who know nothing about the realities of publishing. Even if they don't want to drain your bank account, it's likely that they have no track record of sales to paying publishers of any kind." Yeah. Especially the part about "literary agencies that claim to specialize in poetry" (yes, believe it or not, there are some!) Give it the credibility test. Ya think they're really going to sell your book for so big an advance that they can make a profit on it? Really? Well, if it's not likely that they'll make a profit off the poetry publishers, just who do you think they're planning to make their money from? Modern poetry in China is dead... or is it? "Poetry is more like a pipe transmitting various emotions in today's society," said Wang Chenlong, 24, former president of the student poets society at Minzu University of China, Beijing. The Jam is an end-of-semester celebration of music and the arts that thrive both on and off The College of Wooster campus, consisting of an array of individual artists and ensembles from a myriad of art forms and media. The gathering will take place at the historic Wayne County Fairgrounds on April 20 and 21, using several distinct and non-traditional venues. One may hear an A Capella ensemble, the Ohio Light Opera, the Cedar Valley Cloggers and the best rock music on campus – all at different venues simultaneously. The Jam is a unique fusion of language art sound motion music and interactivity. We are looking for participation by Visual Artists, Installation Artists, Musicians, Media Artists, Light and Sound Artists, Theatre Artists, Poets, Sculptors, Performance Artists, Laser Artists, Magicians, Electronic Artists, Drummers, Video Makers, Filmmakers, Dancers, Floral Artists, Street Performers, Culinary Artists, Ceramicists, Sculptors, Fire Artists and more to participate in our art event! We welcome your imagination and ideas. The Jam is organized by The College of Wooster students at the college’s Center for Entrepreneurship (C4E) under the guidance of James Levin (founding director of Cleveland Public Theatre and Cleveland’s IngenuityFest). Further information about the Jam’s staff and history can be found on our website, listed below. The Jam will take place from 4:00pm to midnight on Friday April 20, and from noon to 11:00pm on April 21 (in collaboration with the Wooster Ethnic Fair during the afternoon). Free shuttles will transport students from the campus to the Fairgrounds throughout the two days. This weekend in Oberlin. Next weekend in Cleveland. Lots of places still looking for poems... so what's keeping you from submitting? "New Pages "Call for Submissions"
Borsenik's haiku is an example of how to make the most out of minimal language. The kigo--"full moon"--refers traditionally to Autumn, a season of slowing down and loss, as well as longing and memory. Borsenik's use of "spill" and "white" connotes the cliche adage, "Don't cry over spilt milk," but successfully navigates around using all but the most spare of allusions. Thus, readers are put into a scene of loss, unresolvable loss perhaps, which is juxtaposed against the austere beauty of light from the full moon. Quite a moving and resonant haiku.